Did you know that on average, one driver wastes 1-2 tanks of gasoline each year due to idling? This means that by decreasing idling, which means turning off your car when you are not driving, car owners can save money while reducing emissions! Grades of Green Youth Corps Eco-Leadership student Clara was inspired to reduce emissions and help save people money so she decided to promote No Idle Zones at her school, American Martyrs in Manhattan Beach, CA. Clara kicked off her No Idle Zone campaign on January 24th, and it was a huge success! The morning of the event, she gathered her dad, sister, friend and Grades of Green advisor Robyn to help her spread the word. 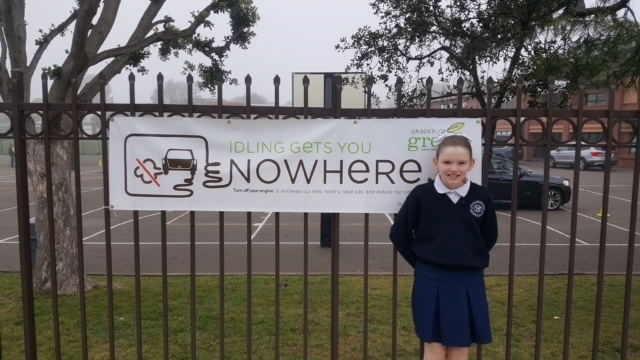 Clara prepared for the event by hanging a Grades of Green No Idle Zone banner on the gate outside her school. Clara and her team created and handed out nearly 60 small flyers to educate drivers on how idling is harmful to the environment and asked them to turn off their car engines when waiting to drop off or pick up their kids. Amazing work Clara! Interested in implementing Grades of Green's No Idle Zone Activity at your school? Click here for all of the resources you need to get this activity up and running!